Much of the art world pre-dating the 20th Century is clearly dominated by male artists. Those few women who showed talent and skill are even today often depicted as followers of “great men” rather than great artists in their own right. The works of Mary Cassatt and Berthe Morisot are still rarely discussed without comparing their works to Manet, Degas and the other Impressionists. Women artists were limited in their artistic endeavors by social convention – nudes and depictions of males in any form were strictly taboo. Women in general were expected to forego careers in favor of motherhood. Painting and other artistic endeavors were simply activities ladies of fine families did to pass the time. Even a modern historian goes so far as to imply that Berthe was some sort of independent spirit who painted against her family's wishes. Fortunately for the world, that couldn't be further from the truth – her parents and her husband supported her efforts. Morisot's future as an artist began early. Some would say it was part of her heritage. Though sources have listed him as her grand-father, great-grandfather as well as uncle, the Rococo painter Jean-Honoré Fragonard sits firmly on her family tree. Another work identifies her grandfather as a distinguished architect and another mentions that her father, Tiburee Morisot had studied in the Ecole de Beaux-Arts. Tiburee didn't pursue painting as a career and would become a government official. The eldest Morisot daughter, Yves, lost interest in painting while Edma and Berthe moved on to receive instruction from Camille Carot. The two sisters continued studying and working together. They spent time in the Louvre following a traditional art education which included copying the works of the masters. Both are also believed to have studied with Oudinot at Pontoise who was said to be a better teacher than Carot but had adopted Carot's style of painting which included the new plein air style of painting outside rather than inside a studio. 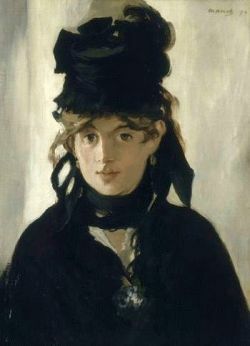 It was while at the Louvre, that most historical accounts have the sisters meeting another young artist, Edouard Manet around 1861 but not becoming friends until years later. Other accounts tell of the elder Morisots introducing their daughters to Manet. The Salon de Paris accepted two of Berthe's landscape paintings in 1864 and Edma also began exhibiting that year. They exhibited together until Edma married a naval officer in 1868. Edma left her painting career behind to attend to her familial duties. Accounts vary as to how the relationship between the Manets and the Morisot sisters developed. Common to all accounts is that Berthe and Eduoard both influenced each others' art and that both family's became close. He disliked the use of professional models but found in Morisot a beautiful and engaging women to depict on canvas. 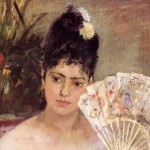 In fact, the portrait most often used of Morisot was painted by Manet in 1872 with Morisot wearing mourning clothes after the death of her father. Not finding a self-portrait that showed what a beautiful woman she was, I've decided to use Manet's portrait Berthe Morisot with a Bouquet of Violets for her biography on The Famous Artists. 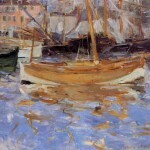 Some say she taught him the plein air technique and encouraged him to use brighter colors and others say he taught her aspects of clarity and light. Most would agree that after their friendship grew, both artists' works showed characteristics of the other. 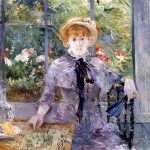 And, some accounts I found while researching this article for The Famous Artists implied that the mere female artist had Manet to thank for her career at all – a sentiment no doubt coming from the perspective that true art was a man's game while ladies where relegated to the ranks of hobbiest. We can also see his influence from her transition from primarily landscapes into more figural works which she first exhibited in the Salon in 1870. In the years that followed, she would submit both landscapes and figural pieces to the exhibitions. Regardless of who taught whom what, Manet and Morisot both became major players in the Impressionist movement as well as the establishment of the Salon de Refuses. She and Camille Pissarro were the most consistent exhibitors at the Impressionist exhibitions. Morisot was thought to have a played major role in the organization of these events and the keeping the temperamental artists working together for the advancement of the Impressionist movement. 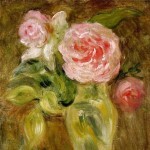 Her friends and fellow artists included Manet, Degas, Gauguin, Alfred Sisley and Renoir. 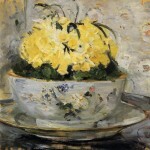 Morisot completed most of her work in Paris. Her landscapes were inspired by Pontoise, Compiegne, Fountainebleau and Bougival with her seascapes inspired by the coast of Normandy, Nice and England. She lived long enough to see her work become publicly recognized when La femme au bal was purchased for 4,500 francs by the Musee du Luxembourg. Her dear friend and admirer Stephane Mallarme was instrumental in convincing the museum to add the piece to the collection of Impressionist works. The families were close and Mallarme's daughter and Julia Manet were close friends. Eugene Manet died in 1892, leaving Morisot alone with a young daughter. Morisot knew her health was failing and named Mallarme guardian of her daughter in her will. Berthe Morisot died of pneumonia in 1895 and young Julia went to live with the Mallarme family.